Sanjeev T is an award winning Singer/Guitarist and Music Producer, Sanjeev is also the Lead Guitarist for Oscar /Grammy Winner A.R.Rahman for the past 5 years and has toured Globally. 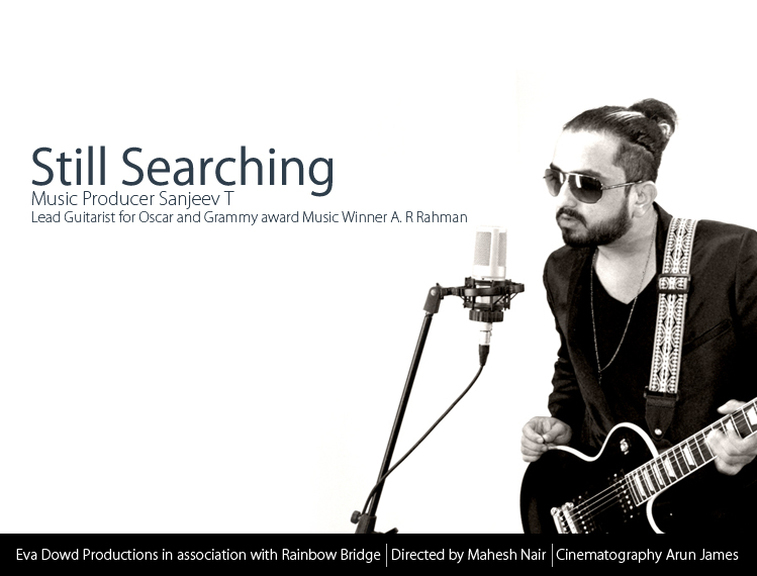 I have promoted and became has worked with Sanjeev Thomas over a decade ago , Free Will Project we co-produced in 2010 the video Still Searching from the album was awarded one of Best Indie Videos in India and nominated for several International Awards. Please view videos below and link for free download of tracks. ﻿Free Will is ﻿a word too vast to describe. So many references of this word has gone through scientific religious and philosophical spheres. The ability to make a choice without coercion , That's what the dictionary says. But yet the meaning of Free Will is never the same as freedom can never be really explained or contained. Why is the name of this album "Free Will". Well, I until recently, had the name always on my mind. There was a choice of naming it "Still Searching", which was also my state of mind on working with this album and the music. This album probably took three years to come from me, involving writing many new songs, removing songs, bringing some back again. It was a constant struggle to find myself in the state I was, caught between my allegiance to Rock and my dawn into the other genres of music. And finally I decided just recently, that I would do what I truly just felt like doing. no Coercion, no Music Industry no Hungry rock fans to decide my fate. I had to take the decision to just let it all go, to forget the politics and just make music which is natural to me as I could never really find a definition to my aspirations and goals. I am a person who is interested in many fields of Creative Arts, Be it Music, Dance, Design or Videography. I truly wanted to just display my current interests and feelings through the music. Not be a part of critics and genres. Music truly to me is a state of mind. A translation of a feeling. A story. An emotion. Every person in the this world, has a role to play. A role to switch maybe even. Big or small, A difference is always a refreshing inspiration to the next. I really do not know what to expect out of a Multi genre album. I still tell my friends that my album is a Masalaalbum and I do not know where its going to take me. But I know, I've finally done it and going to get it out no matter what. Its easy to work on somebody else's music, but with you're own creation, You are always caught in a vicious circle of never being satisfied. There are many songs that didn't make it to this album. I hope I use it all some time. It has been a trying time for me this journey of Free Will, I would like to thank all the artists that have worked with me for this album. Without you all, This would have been a waste of time. I would especially like to thank Eva Dowd, My Best friend and Promoter to have seen me through this trying time, and giving me more than support to my music and this album in particular. Without her this wouldn't have been possible. Free Will is an expression, a hope to live more. To push new challenges and be stronger everyday. A hope to purpose, A life to discover in the open.